A young Black woman discusses how she got AIDS from her boyfriend, who was shooting drugs, and passed this disease to her baby. Photograph of a woman with her elbow on the edge of a crib. Order number: P060, CDC National AIDS Clearinghouse, Catalog of HIV and AIDS education and prevention materials 1993, p. 17. 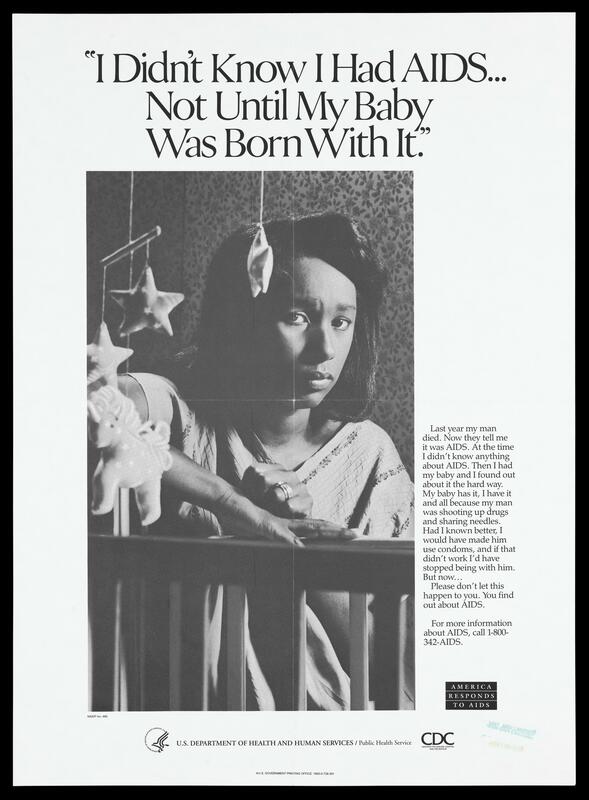 Actual publication date unknown; the America responds to AIDS campaign began in 1987. J Pediatr Hematol Oncol. 2014; 37(1):35-42. BMC Public Health. 2003; 3:28. Role of lay midwifery in maternity care in a large metropolitan area.